Repairing corrupted iPhoto library | Christoph Bartneck, Ph.D.
My iPhoto library was corrupted and even the Apple’s build in tools for repairing the database and rebuilding thumbnails did not longer work. Any attempt to use these tools lead to a crash. Working with the photos was also increasingly difficult, since iPhoto would frequently crash. The library contains more than 33.000 photos spanning 12 years. I was not prepared to give them up. I have been using iPhoto Library Manager for some time for quickly moving between libraries but today it became my true champion. The software has a tool to recover corrupted libraries. But it works differently from Apple’s approach. It starts with a fresh clean library and imports all the photos, including their meta data, such as location, faces, date. It also manages to rebuild albums and folders. After nearly 20 hours of processing, my new library was fully functional. No more crashes or missing thumbs. The culprit turned out to be the QuickTime plugin Perian. Once I uninstalled it, iPhoto worked without crashing. It is a pity, since Perian is so useful. What happens when you cant even open Iphoto after a corruption please? Hi, I downloaded the iPhoto manager and created and built a new iPhoto library. When I try to open the thumbnails, I get a big triangle on a gray background with the words “missing tiff”. Did I miss a step somewhere? Any suggestions for me? Thanks, I have been struggling with a a corrupted iphoto library for 2 years and spend many hours at the genius bar. 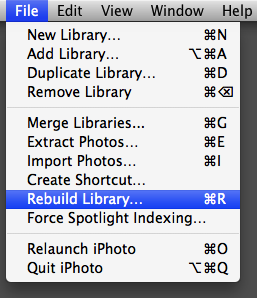 Thanks to iphoto manager I was able to rebuild the library. It was so easy all I had to do was to click button and leave all night. Manager did everything. Thank you very much. I had a corrupted Iphoto library for over a year and just downloaded Iphoto Manager and recovered all my photos. I am so happy ^_^ Thanks heaps. @PAt; I have the same problem – “Missing tiff”. Have you solved yours? It seems that repairing with iPhoto Library is not enough for me as well. I rebuilt my library using iPhoto Library Manager, and it did not help. My thumbnails still will not lead to a usable image. I get a “Missing.tiff” message instead. Christopher how do you figure out what the culprit is when a library is corrupted? My images are corrupted but i don’t know why. Images show up as a repeated pattern of a section of the image. The software is not intended to repair damaged images. It is intended to repair the library. There are some recovery tools for images, but I am not an expert on them.